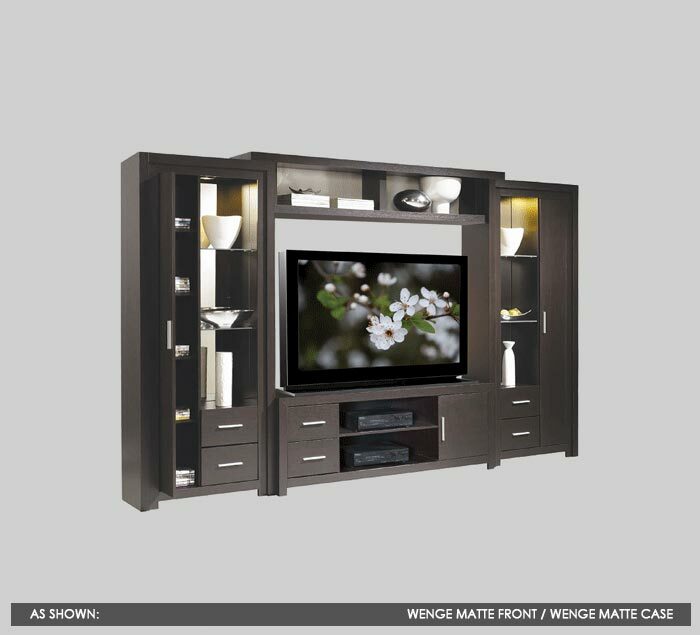 This entertainment center puts your TV at the center of attention while providing you with an abundance of display space and concealed door and drawer storage all around. Wall unit features a symmetrical multifunctional design that perfectly complements any contemporary or transitional decor and space as well as lending itself to the new sleek, flat TV designs popular today although traditional tube and non-flat televisions can just as seamlessly be accommodated. At the center of this entertainment center lies the TV cavity with component section below. This center area features an open back, making cable management easy! No more hassle getting your wires in and out and for proper heat ventilation for your cable box, DVD & Blu-ray player, home theater surround sound system, game consoles and any other equipment that you need to properly store and easily connect. The side cabinets to the left and right of the TV each feature a display section on the inside with 2 glass shelves, mirrored backs and lighting fixture along with 2 small drawers below and a slim solid door w/ 4 interior shelves on the outer edge. There is even more space for your belongings with the 2 open sections above the center cavity for added light storage. Lastly, a door on the right hand side of the TV stand along with 2 drawers to the left are perfect for your CD and DVD collection and anything else you need concealed yet readily accessible.